Today at Sundance, Dropbox with Time-based comments was announced. The new feature focuses on the needs of photographers and videographers. At first I was like, it’s a file-based cloud service, what more would you do there than grab a file? Enhanced playback. Scrub through 1080p video previews with thumbnails and audio previews with waveforms. Broad format support. Preview and comment on over 30 video and audio file types, including QuickTime, MPEG-4, MXF, MP3, and WAV. Fast approvals. @mention team members, clients, and vendors to notify them of your comments. The reason Dropbox picked Sundance for the launch is 2/3 of films there were made with the cloud service. Extremely Wicked, Shockingly Evil and Vile by award-winning director Joe Berlinger were made by people using the new feature. For a documentary, time is money and the makers are spending less of it by using Dropbox. Promoting the new feature, Dropbox has published blogs about filmmakers. 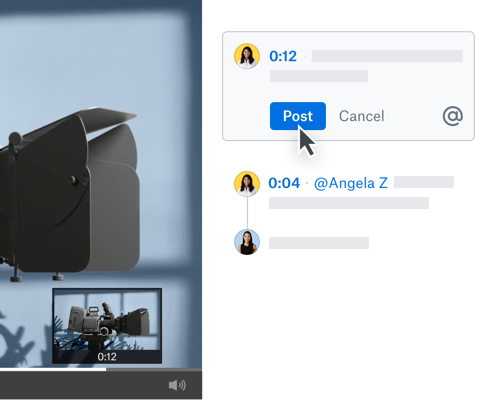 Considering how sending media files for review and gathering feedback is a critical part of how creative teams work (including mine), time-based comments is a valuable new feature. Time-based commenting is available today on dropbox.com for paid accounts. The iOS app has it too. Android support will follow.